What is a Business Advisor & Why Do You Need One? What is a Business Advisor, and What Can One Do for You? You’ve been in business long enough to hear all kinds of advice, and sometimes it can seem overwhelming. You’re in business to do what you love and make money, not to worry about the small details. This is where a business advisor like Mark T. Moore can help you. He will be that neutral party who can provide professional mentorship to help you become a stronger and more profitable leader. A business advisor is there to help the “business” side of your company not only improve, but also maintain that success going forward. Business advisors know everything there is to know about strategic thinking, planning, and implementing those plans in a business setting. What’s more is that they are also great teachers with a lot of experience—they tend to have had their own successes in the business world and have decided to branch out into helping others have similar results. Business advisors work with you to produce great ideas and visible results and give you the advice you need to get there. If a problem comes up, they can provide solutions to fix it. Because it’s a relationship, an advisor will care what happens in your business and monitor your progress to make sure that you’re using your immense potential to the fullest. Most business leaders don’t feel comfortable confiding in anyone at their organization about their concerns and struggles. An advisor can take on this role as a confidant in addition to being a mentor. 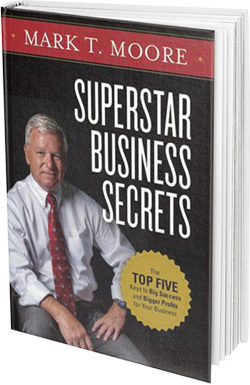 In Superstar Business Secrets, you will learn the powerful lessons that every business owner and CEO needs to know. What Type of Business Advisor is Mark? Mark, the founder of Sales KnowHow and author of Superstar Business Secrets: The Top Five Keys to Big Success and Bigger Profits for Your Business, has an incredible wealth of knowledge from his 30 years in business in two countries. In that time, he’s spoken at and done workshops for many organizations, like yours, with goal-oriented, success-driven leaders who have the potential to become Superstar Businesses. He’s worked with entire teams, as well as CEOs and small business owners to help them all work toward their leadership potential. Experience would be nothing without a way to share it with others. Mark is an engaging speaker whose workshops are packed to the brim with information. He’s built everything he has from the ground up and has a passion for helping others that he’s using to help businesses around the globe. This isn’t a man who’s looking at the bottom line—this is a man who’s going to make sure that you get where you’re going. Do you want to get by in your business, or do you want to shoot for the stars? You’ve worked hard for your success: become a Superstar Business Owner and get rewarded for that work. Contact Mark by filling out the online form to get the guidance you need.